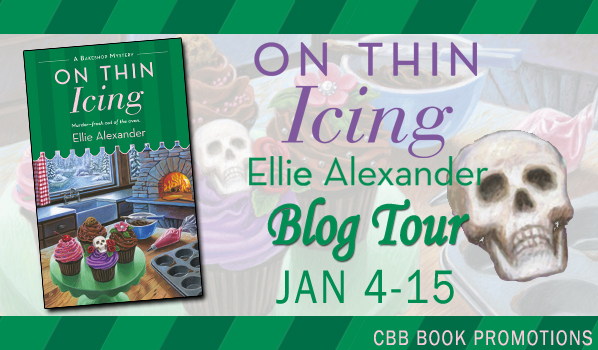 Welcome to my tour stop for On Thin Icing by Ellie Alexander! 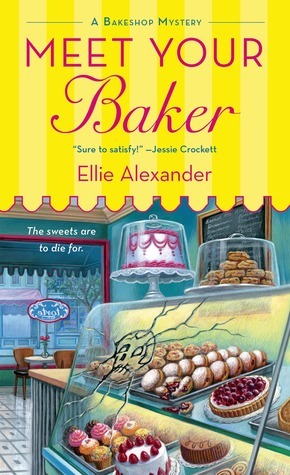 This is the third book in the Bakeshop Mystery series and is now available for sale. 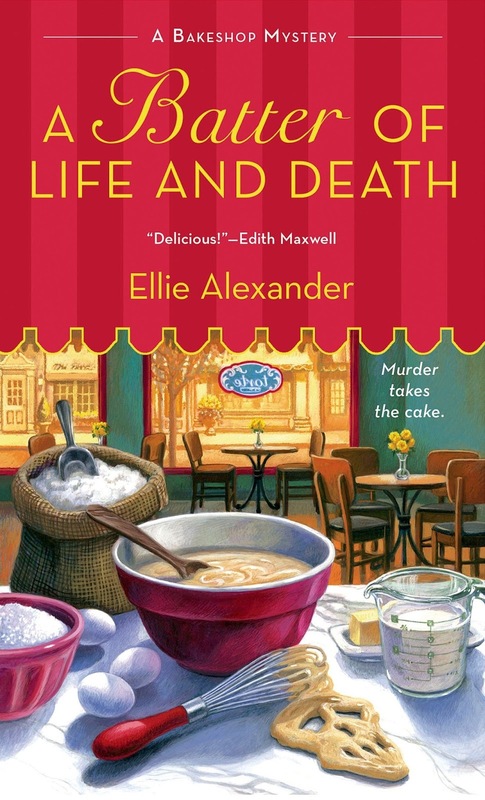 The blog tour runs January 4-15 with reviews, interviews, guest posts and excerpts. Check out the tour page for the full schedule. The sky was a lighter shade of purple as I stepped into the biting wind. Snow swirled all around me. It was as if a wall of white had swept across the lake and was heading straight toward the lodge. The sound of the wind hissing through the sturdy evergreen trees felt ominous. It looked like the weather was getting worse by the minute. It was hard to find the path to the marina. The lake was to my right. As long as I kept the lake to that side of me, I knew I would eventually run into the marina. For a moment I thought I saw a flash of movement on the lake. I stopped and tried to get my bearings. Was someone out there? Or was it the whipping snow? I crunched onward, trying to remember the last time I had been in a storm like this. Probably when I was a kid. It was incredible to watch the snow spit from the sky, but this wasn’t a trek I would want to make again today. I’d have to be sure to grab as many supplies as I could carry. After another hundred feet, the marina came into sight. Thank goodness, I let out a sigh of relief. I shielded my face with my hands as I turned into the wind toward the building. It was hard to tell where the sky ended. Everything was a sea of white. I knew that there was a long dock attached to the marina, but it wasn’t visible in the blinding white snow. I felt my way along a short fence and up the marina’s wooden ramp. It was slick with ice. I had to grab the wall to steady myself. I fumbled in my coat pocket for the key. Even through my insulated gloves the tips of my fingers felt numb. The gloves were too bulky. I’d have to take them off in order to use the key. Pulling off one glove, I stuck the key in the lock and jiggled it. The lock didn’t turn. I tried it again. Nothing. I removed the key and examined the lock. It looked as if something had been forced into it. I tried again. This time I gently twisted the key from side to side. Time for a new plan, Jules. I blew into my hand to try and warm it. That’s when I noticed a shaft of light from underneath the door. I kicked the door with my foot and to my surprise it swung open. Maybe I should have tried that first. Snow had blown under the door in drifts. The lights in the front of the marina were on and I could hear the sound of the heater humming. Puddles of melted snow pooled in front of wire shelves stocked with fishing bait and tackles. Uh oh. Someone must have left the door open last night, I thought as I stomped my boots and stepped inside. The effort was futile. Melting snow dripped from the bottom of the marina’s racks filled with chips, candy and energy drinks. The entire store looked as if it had been blasted with snow. I wasn’t sure where to find the freezer. A long wooden counter ran the length of the back wall. A chalkboard displayed snow reports and fishing conditions as well as prices for rentals. I paused and studied the sign for a moment. The words “For Rent” and an arrow pointed toward a rack of hunting rifles hanging on the wall. You can rent a gun? No. I glanced at the rack, it was nearly full, with one empty slot. Then I looked more closely at the sign and realized the arrow was pointed at a row of fishing poles, not the guns. That made more sense. There was no freezer in the front of the marina, so I headed toward the attached pizza shop. It must be in there, I thought. The pizza shop was designed in the same knotty pine style as the rest of the resort. It had a retro feel with old video game consoles and a bookcase filled with a variety of board games, puzzles and books. A genius distraction to keep hungry kids occupied while they waited for their pizzas. A large whiteboard with the pizza menu read: Closed for the season. See you again in the spring. I walked behind the counter into the pizza kitchen. The kitchen definitely hadn’t been used in a few months. A layer of dust had formed on the countertops and the space smelled musty. The freezer was in the back. I opened to find it stocked with pre-made pizza crusts, cheese, and other supplies. But not our sausages. Where else could they be? I surveyed the shop again. A sign directed customers outside for ice. Could that be where Sterling had put them? Pulling my gloves back on, I took a deep breath and prepared to head into the bitter wind again. Sure enough there was a large chest freezer on the covered deck outside. Jackpot! I brushed snow from the top of the freezer and pushed the lid open. A shock assaulted my body as I lifted the lid. 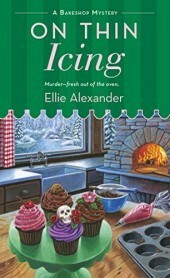 I threw my hand over my mouth and stepped away from the freezer. Our supplies weren’t inside the frozen cavern, but something else was. A body. A dead body. 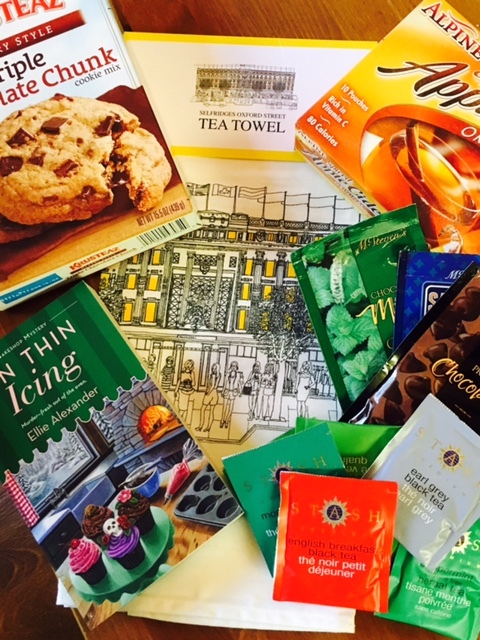 ← 2015 in review & New Year’s writing goals – what are yours?